So you made it through the storm? That’s great news! Now, it’s time to make sure that everything is in tip-top shape, and the first place that you should start is with your roof. 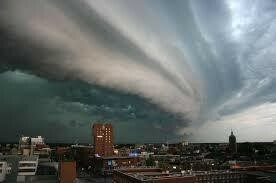 Your roof takes more abuse than any other part of your building – and this is especially true during a severe storm. Depending on the severity of the storm, or the volume of storms that it’s seen over the years, all of that abuse is eventually going to take its toll. And, that toll is usually exacted in the form of roof leaks. So, after that severe storm you just endured, make sure examining your roof thoroughly for leaks is the first thing you do. They may not be readily apparent, though, so here are some tips for locating them so that they can be promptly addressed. Before you get the ladder out, take the time to investigate the ceilings and walls that sit below the roof. If water managed to leak through during the storm, the damage should be fairly apparent either through a leak itself or spots that appear damp. If you locate any such areas, this should offer some idea of where the leak is coming from in your roof. However, it’s important to remember that, due to your roof’s slant and other elements between the roof and the ceilings and walls, where the leak appears to be coming from inside may not actually correspond to where water is getting through the roof. If there was a lot of wind during the storm, and perhaps even flying debris, then it’s possible that some shingles or tiles on your roof could have been damaged or ripped off entirely. So, conduct a visual inspection of the roof and attempt to locate any shingles or tiles that have become dislocated, damaged or are missing. Any damage of this nature should be one of the first things you should address, as a damaged or missing shingle or tile will absolutely allow a leak to develop. If you’re not familiar with the term, “flashings” refers to the strips of metal that bind your roof to other elements of your building’s structure. The flashings prevent water from leaking through at these junctures, which are often places where – if water were to leak through – you wouldn’t notice the effects inside. These metal strips are especially susceptible to damage during a severe storm, and can be pulled up or ripped off by wind. Therefore, you should inspect the integrity of all the flashings around your roof. If any appear to be missing, damaged or out of alignment, you’ll want to fix them. If there was a lot of rain, then your roof’s gutters and drains were put through their paces. While a leak won’t emanate from the gutters and drains themselves, if they’re damaged or clogged, it will significantly increase the likelihood of a leak forming during a future storm. So, while you’re inspecting your roof for leaks in other areas, be sure to take the time to check your gutters and drains and to address any issues like damage or clogs. If you’ve uncovered a leak inside, but are having trouble identifying what’s causing it on the outside, then here’s something you can do: Make your best guess as to where the water is getting in, and use a hose to spray a small but adequate amount of water on the trouble area. If water then appears to get through on the inside, then you at least have a ballpark area to consider for closer inspection. If not, then try the same trick again on another suspected trouble area.